BLOOD LIONS – WHAT DID WE LEARN? For the first time in what seems more than a month, the sun finally returned from vacation and greeted us with its warm presence this morning; and even hung around for a sunset. The temperature was a near perfect 78 degrees and it was about as perfect of a day as one could ask. Yet, there was a feeling of emptiness, and there was a feeling that something just wasn’t quite right. Twenty-four hours earlier, many of us took a collective breath, found a comfortable chair and settled in to watch the long-awaited premiere of Blood Lions. Some of us had the box of tissues next to us, some of us had a stiff drink; and almost all of us had our hand on the remote control, just in case the program was just a little more than we could take. Many of us had a general idea as to what we would see but weren’t sure if we were entirely prepared for the truth. Others may have only heard about the concept of canned hunting, and were only vaguely prepared to watch. And those channel surfers just looking for something to watch were truly in for a rude awakening. For those of us able to soldier through the full hour without breaking down emotionally (there were many of those, and understandably so); or without throwing a brick through the television (I managed, although there were a few times I was looking for that brick), what did we learn? And for those that could not, did not or will not watch this program, what can we share with them? To respond with the most basic, matter of fact, answer: there are many liars among us, and there are many more that have some misguided understanding view of conservation…or CONservation, which may be a more accurate pronunciation of the word. Among the more interesting, or should I say, disturbing facts are these…although I hesitate to use the word “facts” universally. Some are facts, some are myths, some are downright lies, and some just leave you puzzled. An opponent of canned hunting is known as a “greenie”. Okay, I guess green is a term that is associated with the environment. It’s a good word. My favorite color is green, so I have no problem with this. For a canned hunt, all you need is a long weekend. Zip over, shoot a lion, and zip back. Three days and two nights is all that is required. After all, this is the immediate gratification society. No time to waste. Traditional trophy hunting of lions costs an average of $76,000, requires a time commitment of 21 days, and is only met with a 61% success rate. 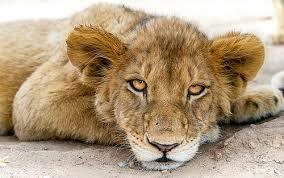 Canned lion hunting costs an average of $19,000, requires only 3 days and has a 99% success rate. And they even offer trophy insurance for that 1% that fails in their quest for a trophy. Unlike traditional hunting, the canned hunt virtually guarantees success through a program that involves captive breeding. 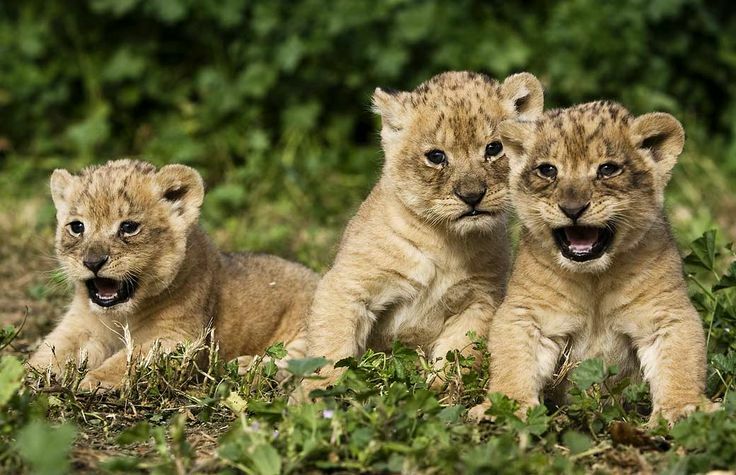 This program includes the taking away of the lion cubs from their mothers within 3 to 10 days after birth, are bottle-feed, and then ultimately sold to one of the safari outfitters. By this time, the lion has a complete trust of people, so he (or she) has no fear of humans. The lion is then baited with food, unknowingly eating his final meal before execution. And he may be partially drugged, to ensure he remains lethargic and doesn’t run away. However, even if he does try to run, there is no escape. He is enclosed in a small fenced-in area. Many that participate in canned hunting are not skilled at hunting. They have money to spend but could not hit the broad side of a barn. Relying upon their own hunting skills, they probably would not survive without this ambush style of hunting. One hunter took 6 shots to kill the lion, even though he was no more than 30 yards from the animal. 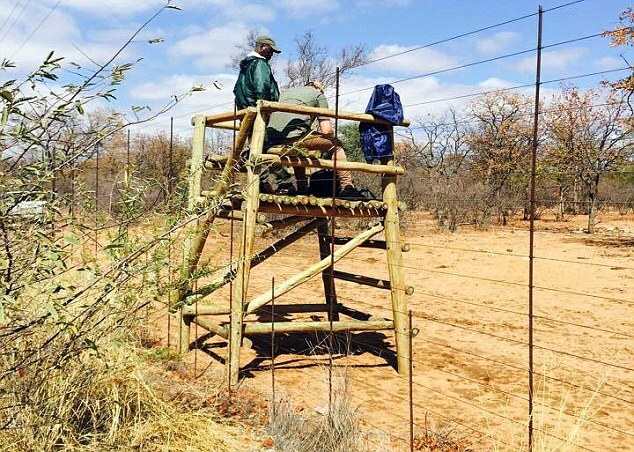 Trapped: The hunters sit on high platforms from where they can take potshots at the animals in front of them – Daily Mail. There are an estimated 6,000 to 8,000 captive lions in about 200 facilities in South Africa. This is an increase from the 1,000 to 2,000 estimated in 1999. Current expectations are that by 2020 (unless this practice is stopped or slowed), there may be 16,000 to 20,000 lions raised for the sole reason of becoming someone’s trophy. There is little concern for the well-being of the lion. “They are not worried about genetics…just need to pump them into the industry and to do as little as possible” So, the poor lion with the terrible gimp and struggle to walk? No problem as long as his “trophy” head is intact. The lack of regulations in South Africa has resulted in the proliferation in this industry. In fact, to operate a lion farm, all that is required is money to purchase the land, the fencing, and the lions. There is no requirement that a person has a background in animal husbandry, or has any veterinary or biological background. In fact, no experience is required at all. Many people are duped into raising these captive lions. For the modest price of $2,800, these farms offer volunteers the “chance of a lifetime” to spend a week interacting with the supposed orphaned cubs. They sell this story as a conservation effort; and that once raised to adulthood, lions will be released into the wild to help re-establish the population. Once the lions reach three to four years of age, they are then sold to the safari companies. Many of the safari companies then post a photograph of each lion with a price below each one. So, the wannabe trophy hunter simply logs in to the safari website, pays the appropriate fee, then clicks on the lion of choice and just like that, the lion’s fate is sealed. There are actually some hunting operators that are angry at this practice and do not agree with it. Unfortunately, they are probably the exception and certainly in the minority. This was the story the documenters were told at facility after facility. Every farm is a sanctuary and this is where the lions live the remainder of their lives. That said, no one could explain where all the lion cubs were coming from, or why there were no older lions on any of these lion farms. 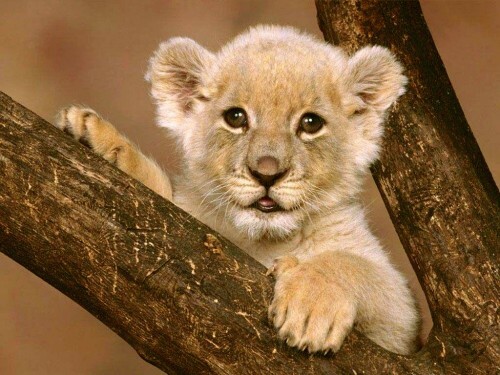 The orphaned lion cubs are hand-raised as part of a “breeding project” to help re-establish the population. These animals have lost their fear of humans and have lost the ability to hunt and survive. No captive lion has ever survived in the wild. So even if this wasn’t a lie, it would be an extremely poorly conceived conservation idea. “Lion numbers are going up as daily as we speak”, so says Freddie Oosterhaus, a hunting operator. As Dereck Joubert responded “Saying the lion population is increasing is like saying the world is flat. You design the argument that keeps you doing what you want to do.” Now if he is referring to the captive lion program, then unfortunately he is right. The number of genetically inferior, inbred, and defective lion population is growing daily. And there are even those conservationists that sadly believe if you shutter the canned lion industry down, the best thing to do would be to just humanely euthanize every lion in the program. It is sad indeed. “I am an animal lover, therefore I am a hunter” – Olivia Nalos Opre. So, this assumes if you don’t kill animals, you can’t love animals. I must admit, this was a real head scratcher. “Wildlife is a very precious thing and every hunt that I go on, it’s not about the kill. It’s about the full experience. It’s about getting to know the indigenous people…about seeing the wildlife and appreciating them and then when the time comes to hunt the oldest animal. It’s going to die a certain death at some stage, so to take that Cape buffalo and give the meat to the people and to enjoy the experience and the adventure and thrill behind hunting. One of God’s most incredible creatures” – Olivia Nalos Opre. I believe this is when I first started looking for that brick to toss at the television. “Wildlife is precious”, therefore we must kill wildlife; but it has nothing to do with hunting at all…it is the experience. Then why not pick up a camera instead of a gun? Every comment she makes above (with exception of the giving meat to the people – which we all know is a thinly veiled attempt to justify and rationalize the killing of these innocent animals), is also accomplished with a camera. Seeing wildlife, appreciating wildlife, getting to know the indigenous people? All accomplished with a camera, and much less expensive. And we know the part about hunting the “oldest” is a complete lie. As long as the hunter desires to take home a “trophy” that celebrates the kill, these arguments will never be valid or accepted. “Hunters are the real conservationists” – Leon Munyan. If you would like to view Leon’s conservation efforts, please visit the Munyan Family Hunting Conservation Museum or his website http://museum.munyan.com/home.html. He touts 313 separate exhibits of accomplished killing…err, I mean conservation practices. And you will be proud to know that Leon has practiced his “conservation efforts” throughout the world, including Africa, Asia, North America, Europe, South America and the South Pacific. And his two daughters have also joined his conservation efforts as well; so we should be pleased that this family of conservationists is so active at protecting the world’s wildlife. If everyone was such an avid conservationist, I’m pretty sure that just about every animal species would have been wiped out by now. Basically, he is saying that animals exist on this earth for our own personal pleasure and we can pretty much do whatever we want with them. And I suppose there are people out there that truly believe that “Man has dominion over the animals” is interpreted to be just this…we can do whatever we want. Needless to say, I and many others strongly disagree with this statement. I would be willing to put my knowledge of animals up against any hunter that wishes to take on that debate. I am not a hunter, but I watch, I study, I read, I observe, I photograph. And there is one piece of knowledge that I know better than the hunters. And that is that the animal does not want to be shot and does not want to be a trophy. Clearly, Leon has a different view of domestic animals versus wild animals when professing his love. I am pretty sure he would have a problem if someone walked into his backyard and shot his four dogs. However, he clearly does not have a problem shooting other animals. “Is this something we feel proud of as a nation? My feeling is I’m not proud of it.“ – Derek Hanekom, South Africa Minister of Tourism. The reality is that as much of the world may be outraged at the existence of this industry; and while there may be certain legislation enabled by other countries (such as Australia banning the import of lion trophies into the country) or bans enacted (major airlines no longer importing trophy parts), the South African nations must take the lead to stop this horrendous practice. It is not conservation and this is not saving the species…nor was it designed to. The South African people need to look inside themselves and ask this question. I believe it would be hard pressed to find anyone truly proud of this industry. “Clearly, of the great evils you can imagine in this world, putting a wild at heart predator into a confined area is one of them. Then sending a safari to shoot him is another.” – Dereck Joubert. I have nothing to add to this. Dereck Joubert is probably the greatest lion conservationist that has ever lived; and has spent the last 40 years of his life with his wife Beverly, studying lion behavior, filming them, watching them. Therefore, when Dereck speaks, people need to listen. Suffice it to say that I am not a hunter, yet my comments are not universally critical of the entire hunting industry. It would be hard pressed for me to pull the trigger and kill any animal; therefore, I am incapable of getting into the hunter’s mind and mindset to understand what drives that behavior. What bothers me is that hunting has reached the level of no longer truly being a sport, if it ever was in the first place. As someone commented about the last stock market crash, when your plumber or butcher starts to offer stock tips, you know something really bad is going to happen. No disrespect to plumbers and butchers, but they excel at their professions. If they excelled at stock picking, they would be stockbrokers. Canned hunting has provided an avenue for those without any true hunting skills to participate in this sport. If you have money, you have the opportunity. Even traditional hunters should be incensed at this activity, as it puts their credibility into question. With the advancement of high powered rifles and bows, four-wheeled drive vehicles that can maneuver anywhere, and global positioning satellites, even traditional hunting provides the animal with virtually no fighting chance. And I fear that it is only a matter of time before drones are used to patrol the killing fields of Africa. Then, the hunter can simply sit in his easy chair, a cool beverage in one hand and the joy stick in the other; maneuvering the drone to target the lion or other animal of choice. Of course, at this point, they would not be hunters at all; but glorified video game enthusiasts. As Rick Swazey, the hunter that assisted with this documentary stated, “This isn’t hunting”. 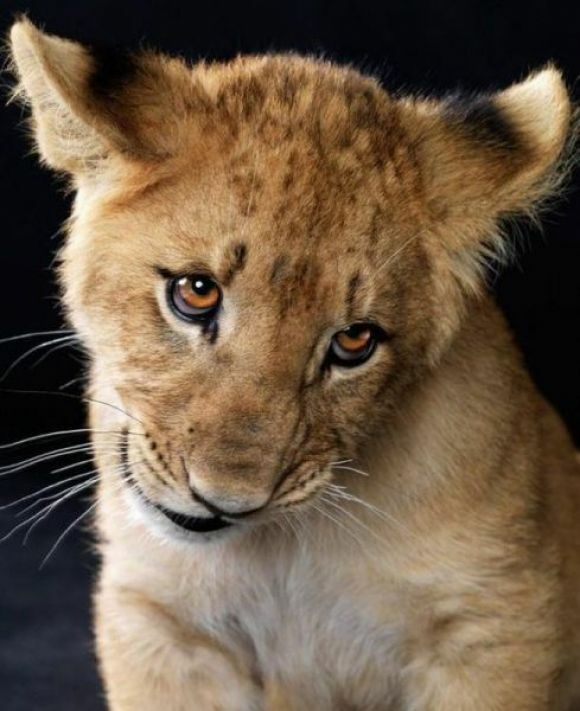 There is a reason that lion cubs stay with their mom for up to two years; and it is the same with the human population. We don’t drop our children off the side of the road at 3 years of age and wish them good luck surviving on their own. During that two year period, the cub learns survival skills…he learns how to capture prey and how to socialize…which is a critical part of the lion social structure. Pulled away from his mother after ten days, he learns none of this, and becomes completely dependent upon humans for everything. He is raised in very sparse conditions, no concern for his well-being…other than to stay alive long enough to be killed. Bred for the Bullet is unfortunately a dead-on description of this young lion’s life. 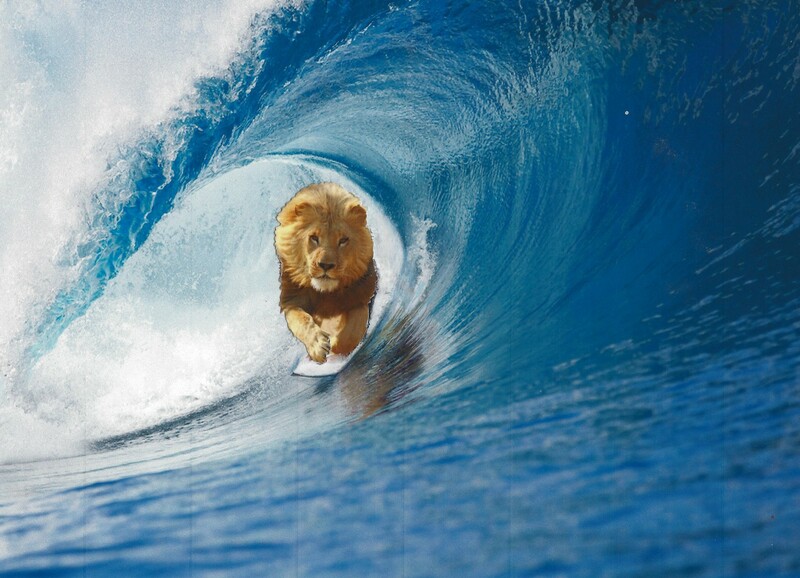 Yes, nature is cruel and the life of a wild lion is fraught with daily challenges of survival. The mortality rate of lions in the wild is high, and many unfortunately, will succumb to starvation, disease, or attacks by other animals. However, that is nature and we need not interfere. To think that we are somehow giving them a better life by raising them in confined quarters and then killing them is ludicrous. Prison offers many of the same benefits. “Three hots and a cot.” Anyone interested in trading in their life for one behind a cell door? I’m not. So, how is captive lion breeding and canned hunting considered acceptable? Pieter Potgieter, President of the South African Predator Association stated that he doesn’t seen a difference between domestic and wild animals, other than the fact that one is tame and one is wild. He also states that the lion is an icon of wildlife, but that perception is only in people’s mind and that captive breeding and canned hunting is a globally accepted practice. I would argue that it is not accepted; and the only reason this practice has existed at all is that most people cannot even fathom someone resorting to such a practice. To participate in an activity with a singular purpose of stuffing and mounting a replica of what was once a wild, beautiful and majestic animal takes the human to a new low level of embarrassment and deceit. Are we capable of becoming even less compassionate, even more unethical than this? The unfortunate answer is probably yes; and it is sad because we should be evolving as a species and elevating ourselves to a higher level. I thought that was the whole idea of life…to evolve, to transcend, to grow, to learn. Canned hunting is none of those. Blood Lions final scene captured the camera zooming in on the innocent eyes of wildlife…not just lions, but leopards and rhinos and elephants. And the question was posed to Ian Michler as to why some hunters actually put their weapons down, and I leave you with his response. It is unlikely that those proponents of lion farming and canned hunting will be moved to change as a result of this film. However, I don’t believe that was the intention, although perhaps it may sway a few. The purpose of the film was to uncover a dark secret that the majority of us either didn’t know about or didn’t believe actually existed. After watching the film, canned lion hunting is now in the public spotlight, and there are few who would disagree that this is a cruel and inhumane practice. The all-important question is, what are we going to do about it? Thanks for writing this, it is very well done. I didn’t actually get to watch the premier, because I couldn’t find it on my TV guide. I must not get MSNBC. But you’ve summed everything up nicely. And just to be fair to South Africa, canned hunting will stop when wealthy foreigners (mostly Americans) stop paying money to kill tame, fenced-in lions. Yes and thank you. Unfortunately, we know those wealthy white U.S. hunters are unlikely to wake up one morning and discover ethics and morality. So we need to stop them with legislation..US FWS services threatened species status (although with Dan Ashe at the helm, who knows if and when that will happen) and the CECIL Act. Then we will see if their “conservation” argument really holds water. 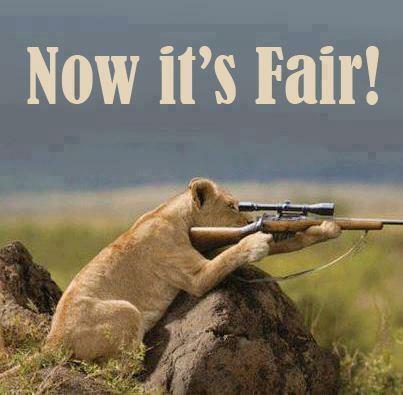 That is, since they will then no longer be able to bring back their trophy, will they still hunt lions? Because you know, they say they only do it for the thrill of the hunt, to kill the oldest and to feed the locals. It’s never about the trophy…it’s about the money they pay that they believe (or want us to believe) is used for conservation purposes. I’m quite sure if there is no trophy, they will no longer hunt, and that will immediately cut the number of lions killed by 60%. Not sure if you are from the U.S.; but I am and I’m terribly embarrasses that we are responsible for such a large percentage of the loss in lion population. I know they are replaying the documentary here 3 more times over the weekend, but they will be releasing the DVD early next year, if you cannot find it on tv. As always, I appreciate your comments. You are obviously well versed and knowledgeable on these issues and I greatly appreciate and always welcome your thoughts. Good point about the hunters…yes, unfortunately I think legislation is needed. I know the USFWS proposed to list the African lion as threatened, but they seem to drag their feet. The only reason US jaguars received protection was through a lawsuit, although in the FWS’ defense no one thought there were any jaguars here until 1996. And yes, I’m from the US. This is horrible and cowardly that these cowards and assholes behind guns would do this to innocent animals. There needs to be laws against this. Especially the farms raising these lions to be tame and knowing they trust humans and they just sit there and shoot them!! It is liking walking into someone’s backyard and shooting their dogs. How can they sleep at night? I am from Minnedota and I hope that Damn dentist from Bloomington goes bankrupt. What a disgusting man that he would lure Cecil out of the park, shoot him with an arrow (a slow torturous way for any animal to die) and then he suffers for Three days. I pray Karma gets him!